Built tough to run long and keep on running, Kubota diesel generators are designed to deliver reliable power when and where you need it most. Our J Series adds an extra compact design, extended operating periods on a single tank of fuel and easy movability so you can use it almost anywhere. They also run clean and quiet, with excellent fuel efficiency and reduced emissions for a greener power solution. 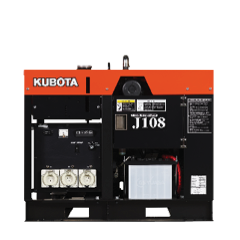 With reliable two pole diesel generators equipped with our powerful, world-renowned engines, maintaining the J series is a breeze. Best suited to agricultural and commercial applications, including back-up power for solar systems and power outages, it’s rugged and durable to give you the added peace of mind that comes with a formidable power solution that’s guaranteed to stand the test of time.